It seems that everything around here is growing so fast... that is except for our vegetable garden... but more on that later. Here are a few before and after images from around the grounds. 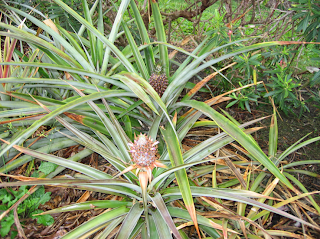 2 of the PINEAPPLE PLANTS when we arrived on March 13th. 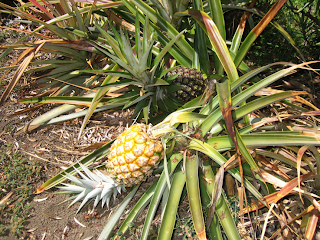 The pineapples just a few days ago on June 21st. I picked one today and it will be part of our fruit salad and yogurt tomorrow morning for breakfast. Life is good. 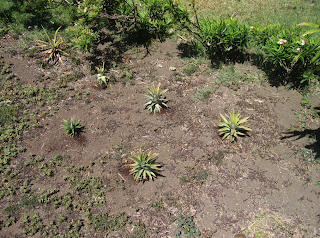 Once peeled, we let the pineapple top dry out for a day or two then plant it about 1" in the dirt as seen here. Hopefully in about a year and half to two years we will get another fruit. One of these tops is from another of our home grown pineapples and the rest are Maui grown from good ol' Costco. Notice the weeds also do very well. 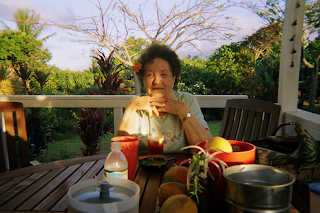 Here is a photo of Grandma (with a Mai Tai) when she first arrived on June 1st. 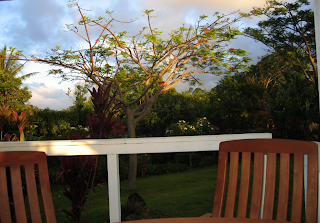 Notice that the ROYAL POINCIANA tree in the background is almost bare. Then just 20 days later it is glowing with orange flowers. It still has a way to go, but it is so amazing how fast things change. Now if the broccoli would just catch on. 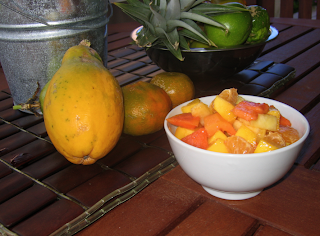 The fruit salad made with what we had on hand... pineapple, mango, tangelo and papaya. This papaya was more orangish-red instead of the golden-yellow we have mostly had, which leads me to believe that it is either a rainbow papaya or a strawberry papaya.